Easter is just about a week away and although holidays are a wonderful celebration they can be stressful when it comes to deciding what to wear. I get it, but let me help you! First off, don’t over think it. Thank about where you are going, is it more casual or more on the dressy side? Is denim appropriate if it isn’t distressed or do we need to find an alternative option? Today, I am sharing two outfit ideas for men and women. One outfit is a casual, while the other one is a bit more on the dressy side. This is a great example of a casual look for Easter. A white flare denim pant paired with a pink satin top and brown wedge shoe. Together the look is accessorized with gold bracelets, necklaces, and a ring. It is nothing too over the top and it is styled with pieces that can be worn again with other items in your wardrobe. That is one thing I love about wearing separates for special occasions. You can usually get more use out of them again! Next, a more elevated look for Easter. A timeless black and white belted dress paired with silver Jenny Bird Jewelry. The outfit is completed with a pointed pump, which adds a great pop of color to the look. By having a color shoe it really adds that extra “spring vibe” to the look. Okay, lets talk about this dress. I love that the stripes are vertical. 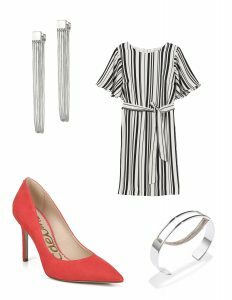 With the stripes being vertical it gives an overall elongated look and is figure flattering. Alright, guys now it is all about you! Okay hear me out on this look, guys. Lets just clear the air first- men can definitely wear white denim as well. It is such a great addition to the wardrobe for spring. 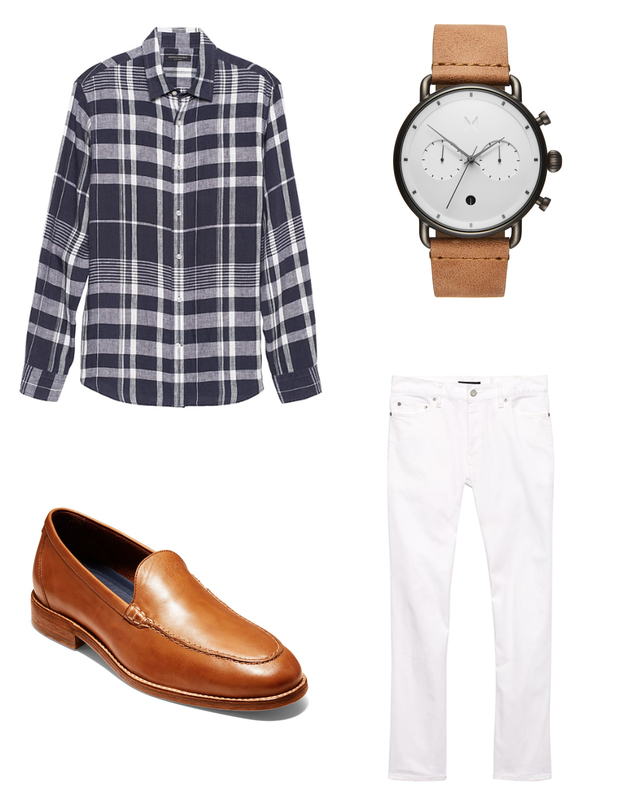 For this look Banana Republic’s white denim is paired with a plaid linen shirt. The outfit is completed with a brown leather loafer and watch. To keep things even more casual leave the shirt untucked and go no socks with the shoes. This is such a fashion forward look for spring! Lastly, a more formal look for the guys. A gray dress pant paired with a white button down shirt tucked in. This outfit is completed with a black leather belt and a black leather shoe by Cole Haan. Now here comes that pop of color again within the tie. Purples are definitely a color of spring and I love how this tie includes multiple shades of purple! 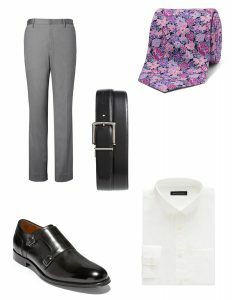 I hope these ideas help you when deciding what to wear for Easter! Remember, spring is a great time to add pops of color to your outfits!